At RCS our job begins on the roof where we apply building principles to our system solutions to provide you with the right tools for success. With a 15-minute installation time and optimal design, TRAC Rail™ is the key curb support system for the most critical component on the roof. Our patented product is pre-fabricated requiring minimal fasteners and installs from the top for convenience and ease. The origins of TRAC Rail™ were derived as the response to the improper types of curbs being installed on Metal Buildings resulting in leaks, damages, and a scar on our industry. This revolutionary product applies construction science and thoughtful design to reshape the integration and usefulness of rooftop equipment. Our TRAC Rail™ Roof Penetration System is the only system supplied by a roof curb company designed to properly address the dynamics associated with standing seam roof systems and erector installation. When the erector or installer is on the roof, the last thing they need to do is stop the job to source floating eave plates, field notch angles to frame a roof curb that may or may not actually support the rooftop equipment, or go look for sealants and fasteners. Beware of imitation "systems"... We can help you get the job done right the first time, fast. This stuff matters if you want a reliable solution. Most standing seam roof systems are designed to travel up to 1-1/2” in both directions with thermal expansion and contraction. If the roof is moving, so must the roof curb. Panel lock down is the primary cause of most roof leaks. The patented TRAC Rail™ Curb Support System is pre-centered and shipped assembled to allow for up to 1-1/2” movement in both directions. This is accomplished without any field assembly or adjustments by the erector. Most standing seam roofs are supported by clips that raise the roof panel above the purlin or bar joist, typically 3/8”, 1”, or up to 1-3/8”. To reduce ponding at the front of the roof curb, the roof curb must be elevated to the same plane as the roof panel. The TRAC Rail™ Curb Support System is factory customized per job. A simple form is completed with the order which gives us the details we need for custom adjustment. Ponding also occurs when there is no cross support at the front and rear curb flange. Without structural cross support at these critical areas, deflection will occur whenever someone stands near the curb to install the roof top equipment. The Trac Rail™ Curb Support System is shipped with the two cross channels pre-notched to match the roof curb’s interior dimension. The structural purlin span channels align with the roof curb. RCS’s welded Uni-Cricket aids in structural support. With no field notching required, erector labor is reduced. Negative pressure is always a consideration with all roof designs. It can affect the integrity of roof penetrations such as skylights, smoke vents, exhaust fans and other relatively light weight equipment. 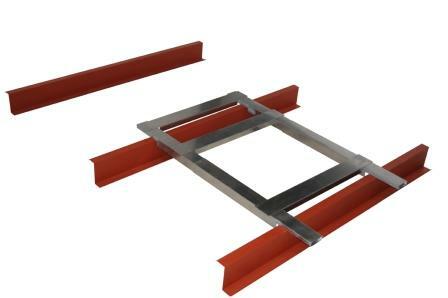 Roof curbs can be slightly lifted or tilted by negative pressure, causing the sealant between the curb flange and the roof panel connection to be disturbed. When this seal is broken, the opportunity for leaks increases greatly. The patented TRAC Rail™ Curb Support System is the only pre-assembled system that allows for full thermal movement while resisting negative pressure via our proprietary Seven Bead Curb Tape. The continual evolution of an industry revolution. CEE-TRAC was originally designed to support the outer curb of a double curb system. Double Curbs present a challenge of determining the exact field location and relationship of the structural I-Beams and purling. CEE-TRAC sets on top of the purlins, so notching is not required. Other good applications for CEE-TRAC are with buildings with inconsistent purlin spacing such are wind bands. With a high clip standing seam roof CEE-TRAC can be used with standard curbs, such as fan curbs, smaller HVAC unit curbs (3 -71/2 ton), smoke vents and skylights. CEE-TRAC is not recommended for Retro-Fit conditions. Check out our Retro-TRAC for an efficient installation solution where the roof is already in place. Ships with sliding stirrups to allow thermal movement in both directions. Front and rear flange support. Elevates the Roof Curb to match the roof panel elevation. Pre-Fabricated: Requires no field notching, assembly, or adjustments. Can accommodate purlin or bar joist roof framing systems. Double and Multi-Spans are available; the number of spans is determined by curb length. 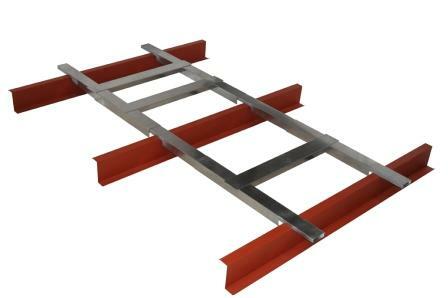 The Retro-TRAC Roof Penetration System has been developed to address the same roof penetration concerns as the TRAC Rail™ with the exception that this system can be installed after the roof is in place. It can be used with standard curbs, fan curbs, smaller tonnage, (3-7.5 ton) HVAC unit curbs, smoke vents and skylights. Elevates roof curb to match roof panel elevation, low clip or high clip (thermal block). Easy to install from underside. 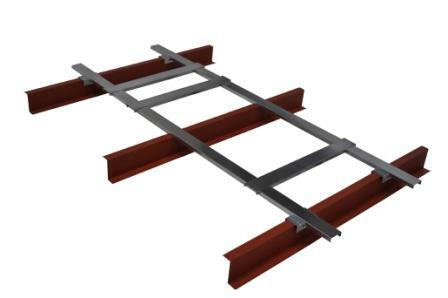 Ships as (2) 48” telescopic channels to accommodate purlins 36” to 60”. Pre-Fabricated: Requires no field notching, assembly or adjustments. Double and Multi-Spans are available. The number of spans is determined by curb length. Mechanical Contractors should not be asked to supply or install roof curbs for metal roofs. All roof curbs should be supplied by the general contractor or building manufacturer and installed by an experienced erector. As a rule, the mechanical contractor is not familiar with metal roof systems and is not responsible for any leaks. There are many cases where conventional HVAC roof curbs have been installed on metal roofs. This results in ongoing maintenance issues for the general contractor. all curbs are not created equal... project coordination and system solutions Determine success. Contact Us to ensure you're covered and supported where it matters most: the Roof.